There are plenty in the UK on ebay. Just keep looking. I had to watch Ebay for several weeks to find mine. I'm sure the pods will be fine. Any continuous feeding is better than what you were doing before. I'm currently just feeding blended oysters. After yours is running, you can experiment with all the different sized particle foods. The question in the cooler. The most important thing, is that when the power goes off and back on, does it come back on without having to touch it. Mine does. That one may not. You'll have to try it. If your power goes off (you turn off the wrong switch, etc), you don't want to have all the food get warm. The other thing is how cold it gets. You want as near to freezing as you can get. Mine gets below freezing at night, and a little warmer during the day. One last thing... if you get a pump of 1.0 ml/day (the cheap ones), you'll need to dilute your food with RODI so that you don't feed as much. 1. I'm only feeding blended oysters now. Is much simpler, and cheaper, and covers all particle sizes from 1 to 200 microns. Most important: Oysters STAY SUSPENDED. Most other foods will settle to the bottom and clog the tubing. I'm using Reef Nutrition Oyster Feast, but similar would be fine. This food will stay suspended a whole month without touching it! 2. I don't get the air out of the feeding bag first. 3. Put a 4" filtersock in the chiller first (fits perfectly, and covers the icy cold steel wall). Then put a 1/2" or so of paper towel on the bottom, to keep the bag off the very-cold bottom area. Then just lightly put the bag in. No need to cover the top if you leave the chiller on "continuous". 4. Wrap the tubing to keep light and heat away from it, especially the heat from the chiller. 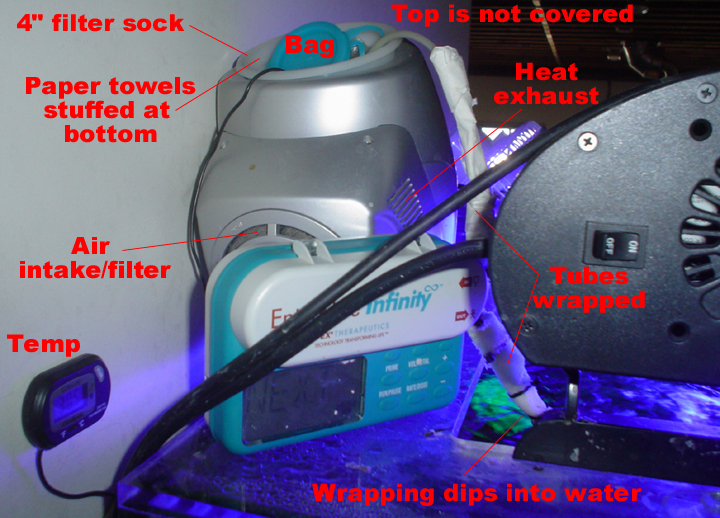 Also, for the part of the tubing that goes from the pump to the tank, if you wrap it with a thin towel and let the towel touch into the tank water, the water will keep the towel wet, and therefore keep it cool. 5. Clean the air-filter on the chiller periodically. 6. For NPS, especially any seafan, put them near and in the direct flow of a powerhead. Even though the polyps may look like they are bending out of shape, they are still getting the most food this way. 7. Super high flow throughout the display, and sump, is critical. You don't want anyplace where the flow stops, since the food will settle out. While settling may help feed the snails, it won't help the corals. 8. Keep a thermometer in the chiller, which you can see while walking by. It stays between 28 and 33 degrees F. The food won't freeze as long as you have a filter sock covering the walls, and have paper towels stuffed at the bottom, and don't cover the top. I once turned off the feeder (but kept feeding the fish/eel) for a month. Every NPS died, along with some other corals, within 3 weeks. The notable exception was a copper colored flower pot that thrives. I never target fed, and won't. The medical pump has been found on Ebay for as little as $100 USD. Get a backup chiller. They are cheap, but not sturdy. I had one go out. Continous feeding puts a ton of food into the water, so start doing it SLOWLY, maybe just 1.0 ml per DAY (not per hour), to see if your Nitrate and Phosphate filtration can keep up. It takes about 3 weeks for the effects of the excess food to show up as increased Nitrate or Phosphate or nuisance algae, so don't think you can increase it each day because you are not seeing any problems yet. If after 3 weeks there is no Nitrate and Phosphate or nuisance algae problem, then slightly increase the feeding amount. There is no limit to how much your corals can eat; the limit is how much Inorganic Nitrate and Inorganic Phosphate filtering you have. If you are designing a system to have a continuous feeder, and a scrubber, then the bigger the scrubber the more you can feed. I'm currently feeding 4.0 ml/day total, for 100 gal. This of course does not include the fish food (about 8 square inches of nori per day), or the eel food (one silverside per week). I've tried this a few times and I had a problem with things getting clogged. I went thru all of my bags trying this over and over. I think my blender is just horrible and can't get it down to a small enough size. Also I noticed i had to water it down a quite a bit before I could have it go thru the tubing. but one thing I'm wondering is if I blend it completely into paste will the fish be able to eat this? It seemed like most of the time they didn't even see it pump out. I'm just not sure how to go about this now. I've learned that if you are blending yourself, the pieces don't get small enough for reliable pumping with this pump, because there is a tiny "particle filter" hidden inside the blue tubing device, designed to block large particles. What I did was pull the blue silicone off, and file off the plastic particle filter with a needle file; then put the silicon tubing back on. It worked much better. However I have since switched to the pre-made bottled oysters, and they are extremely finely blended, so there is never a clog. I've now raised my liquid feeding to 12ml per day. N and P are both "clear". Matter of fact, instead of looking at the Salifert nitrate test from the top (which always looks clear now), I now look at it from the side, and compare it to an identical holder of just plain tank water. A few weeks ago it had a slight pink compared to the tank water (from the side), but today it was just as clear too. It does stay a bit "cloudy", because of the test chemicals, but the important part is that it is "clear" of any pink. Since 12ml is double the 6ml I was feeding before, many of the coral tentacles have come out, and remain out all day, much farther than they did before. I read your post and was able to pull bits and pieces of information on how you feed and maintain your tank using the continuous feeder idea. I'm watching ebay now for a good deal and I should have my setup in the next week or so. You have a interesting approach to feeding and I was wondering if you wouldn't mind caughing up your complete recipe on how you feed and maintain your corals, your fish, and your water chemicals. I'm looking to make myself a checklist and want to follow your regimen to the letter. For your corals, filter feeders, and invertibrates, it looks like you feed them a diet that is exclusively Reef Nutrition Oyster Feast. Is there anything else? For your fish, you mentioned that you used to feed them Reed's Arctipods but have since switched to keeping your continuous feeder filled with Oyster feast for the corals. I assume that you have stopped adding Reed's Archipods to the feeder but is that a correct assumption? I assume that the fish do not eat the Oyster feast so now you only feed your fish nori. Is that also correct? No pellets? No flakes? Nothing else? For your water, What regimin do you have going to maintain your calcium, magnesium, Strontium, and water in general? I noticed in one of your pictures that you have a fairly large bottle sitting on the ground to the right of your tank with a tube that feeds up to the tank. Would you mind sharing with us more about that? Is there anything else you do on a regular basis to keep that awesome tank going?